Inspired by the yuletide tradition of displaying fresh pine wreaths in a front window or door, this classic hand painted Yuletide Greetings card conveys your Christmas wishes to loved ones. Crafted of durable white card stock, this card has a crisp, pristine appearance that's classy and subtle. A beautiful gold foil border adds a touch of richness, enhancing any photo you choose to place inside its frame. Three decorative wreaths dominate one side, giving it a distinctly holiday feel and "Merry Christmas" appears in bright gold at the bottom. Your photo easily slips into slots and stays secure, regardless of whether the card sits horizontally or vertically. 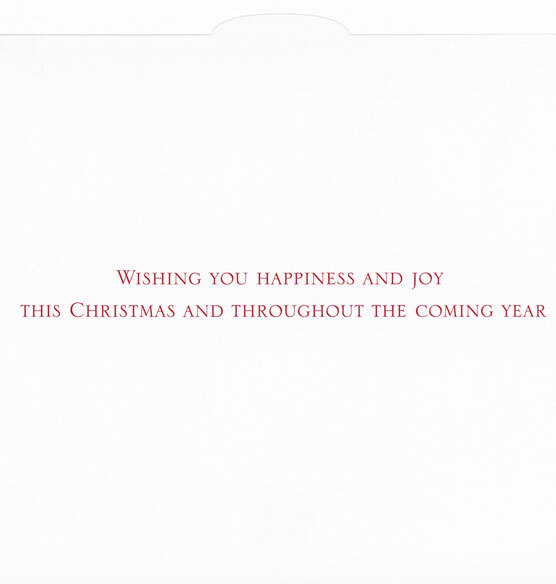 Upon opening the card, your recipient sees a nice holiday sentiment printed in red text. Personalize the interior with up to three lines of custom text. Our exclusive photo holiday cards are the perfect way to stay in touch and share a special moment with family and friends during the holiday season. Pre-printed interior verse: "Wishing you happiness and joy this Christmas and throughout the coming year!" 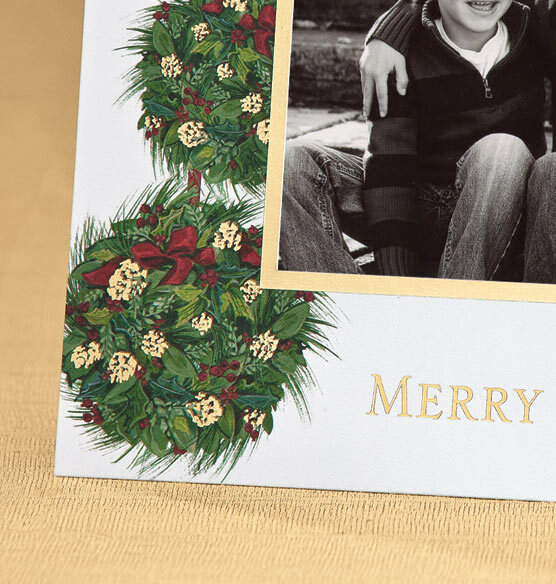 I went to exposures for my Christmas cards because I wanted nice weight, quality cards. I have bought albums and other gifts for them numerous times in the the past. I was surprised how flimsy the card was. There was also no option to change the size of the font or customize the message. I will not get my holiday cards from Exposures again. A beautiful card and made my photo extra special looking. I got a lot of compliments on the card...very classy. Plain & simple good price. I have been buying from exposures for many years. We chose this card because it matched the colors of the outfits that our customers daughter's were wearing. I would have preferred the personalization to be in gold. We'll see when we receive them if the personalization matches the berry colors on the front of the card. They look great and priced right! Loved the decorative cards and verse...also on sale! Really nice card and high quality....I've been buying photo Christmas cards from Exposures for years. I have purchased cards from Exposures for several years. Their quality is consistent and their service is prompt and reliable. These cards are beautiful! I always receive compliments on our cards! This will be my 22nd year ordering our cards from Exposures! They may be a bit old school now, but I love sending a real photo with our Christmas cards. After the holidays, family can place the photos in a frame. I've created an album with ours! I've been ordering holiday photo cards from Exposures for more than a decade, and can always find a design that matches my photograph. I especially liked the three wreath arrangement and I prefer the photo insert. The card will work well with the photo I chose to use. The quality of the card is excellent...and the price is good for a regular set of cards. I have ordered my Christmas cards from here for the past 10 years plus and always been very satisfied with the quality and beauty of the cards. I ordered cards last year, loved them, got so many great comments. they are high quality! 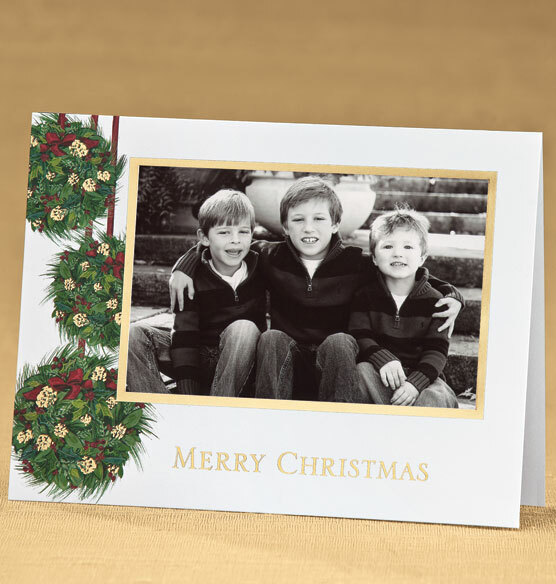 I like the quality of Exposures products and a good old fashioned Christmas card where I can add a personal note. I have bought from Exposures in the past and have been pleased. Also, I saved some money this time. Love the quality! These cards are beautiful! Loved the christmas holly and they were most likely on sale. With this card, is the photo inserted into a pocket on the front flap of the card? BEST ANSWER: Thank you for your question. You insert the photo in a pocket on the inside of the card. We hope this information will be of help to you. What is the greeting on the inside of the card? BEST ANSWER: Thank you for your question. The inside verse says Wishing you happiness and joy this Christmas and throughout the coming year!. We hope this information will be of help to you. How many cards in this set? BEST ANSWER: Thank you for your question. There are 18 cards per set. We hope this information will be of help to you. How many cards in a set? BEST ANSWER: Thank you for your question. Each set has 18 cards and 20 envelopes. We hope this information will be of help to you. BEST ANSWER: Thank you for your question. Our cards are designed to hold a 4" x 6" photo and will use a regular postage stamp. We hope this information will be of help to you. Is there a preprinted message available or must we personalize it? BEST ANSWER: Thank you for your question. The message inside is pre-printed. You can also have your names printed on the inside or add to the message. We hope this information will be of help to you. what size of photo fits in the card? BEST ANSWER: Thank you for your question. 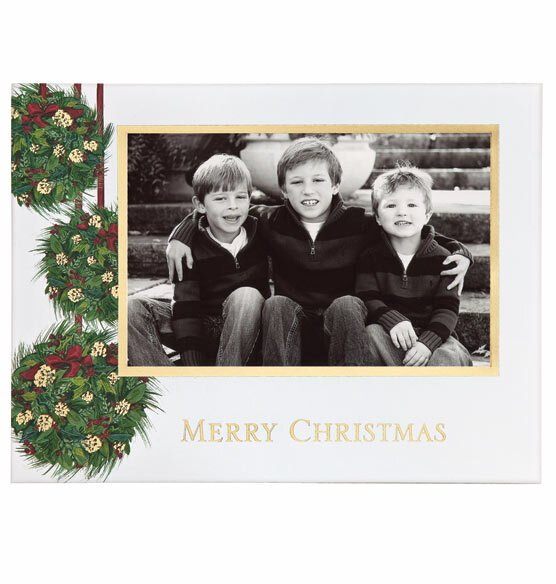 The Yuletide Greeting Christmas card holds a 4 x 6 photo. We hope this information will be of help to you.